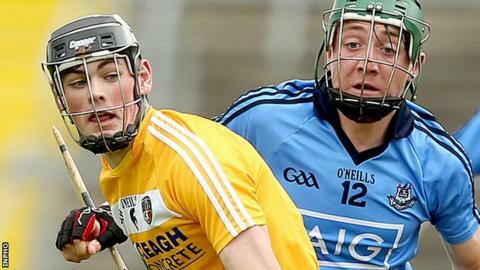 Battling Antrim succumbed to Dublin's superior finishing in Saturday All-Ireland Minor Hurling Championship quarter-final at Kingspan Breffni Park. Matthew Oliver's 11 points tally (10 frees) proved the difference as the Metropolitans reached the last four. Antrim had many excellent performers, with Christy McNaughton contributing 1-6 and this performance gives them plenty of positives on which to work. Dublin sprinted out of the blocks, and led by 1-4 to 0-0 by the ninth minute. Fergal Whitely and Matthew Oliver were on target, and in the ninth minute, Eoin Conroy nipped in for an opportunist goal. Christy McNaughton registered the opening Saffron point from a 10th-minute free, but they were soon on the back foot again, and Carl Sammon stretched the lead to eight points. But Antrim dug deep for spirit and pride, and a touch of magic gave them a 16th-minute goal, Conor Small controlling Ryan McKee's precision pass on his stick before rifling the ball into the net. McKee narrowed the gap to two points, but Fergal Whitely got in for a second Dublin goal. Antrim, with Gerard Walsh performing strongly at the heart of their defence, continued to battle, and McNaughton converted a handful of frees, with Dylan McLaughlin also on target. But points from Whitely and Oliver sent Dublin in with a 2-11 to 1-8 interval lead. Oliver had just stretched the advantage to seven when Antrim got in for a second goal, McKee darting through a gap in the cover to fire in a shot, which was saved by Eoin Skelly, with McNaughton nipping in to finish from close-range. However, that 43rd-minute strike proved to be their final score, and Dublin reeled off seven points to move safely into the semi-finals. Dublin scorers: F Whitely 1-2, E Conroy 1-0, M Oliver 0-11 (10f), M Maguire 0-3, C Sammon 0-2, D Gray, A Considine, E Foley, G King 0-1 each. Antrim scorers: C McNaughton 1-6 (0-6f), C Small 1-0, C Doherty-Cunning 0-2, R McKee, D McLaughlin, L Malloy 0-1 each. Dublin: E Skelly, C Hendricken, D Butler, C Ryan, E Foley, P Smyth, C O'Sullivan, C Sammon, M Maguire, M Oliver, F Whitely, D Gray, C Dowling, E Conroy, A Considine. Antrim: B Connor, O McKenna, D Carey, C Carson, J Maskey, G Walsh, S Duffin, C McMullan, K Malloy, C Doherty-Cunning, C Small, C McNaughton, D McShane, D McLaughlin, R McKee.